Situated in the central parts of the northern state of Himachal Pradesh, Manali is at northern end of the Kullu valley, 280 km north of the state capital Shimla and 108 km from Mandi. Manali is perched at an altitude of 2050 meters above sea level and is spread along the banks of the river Beas. Surrounded by towering peaks at an arm length, Manali's major asset is its proximity to the snowline. 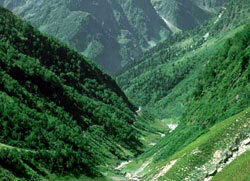 Manali is circled by beautiful glades of deodars and flowering horse chestnuts. It is one of the most popular honeymoon destination and trailhead for numerous treks as well as a great countryside ideal for adventure sport lovers. In the Summer Manali is packed with Pahari-speaking Kullus, Lahaulias, Nepali labourers, foreign and Indian tourists. Manali literally means the 'Home of Manu'. Legend has it that Manu stepped off a boat in Manali to recreate human life after floods had devastated the world. Manali offers marvelous walks through orchards and fairly tale forests of deodar. As one climbs the grassy path the fluid fluting notes of the whistling thrush comes across the forest. Also known as Hadimba temple, The Dhoongri temple (1553A.D) is dedicated to goddess Hidimba, the wife of Bhim. Built in typical indigenous style it has a four-tier pagoda shaped roof. Build by Maharaja Bahadur Singh, the 27m high Pagoda temple has fine wood carvings of animals and plants. There is a legend behind Hidimba. Hidimba, was the sister of the demon Tandi.� Bhima of the Mahabharata fame fell in love with Hidimba. Bhima killed Tandi in battle and married Hidimba, whose spirituality, coupled with her marriage to Bhima led to her being worshipped as a goddess. Today she is seen as an incarnation of Kali. Inside the temple is the small back image of the Devi. The imprinted foot prints on a black rock are believed to be the foot prints of the goddess. The temple has intricate carvings of dancers and characters from various Hindu stories.Horns of bulls and other animals decorate the walls. It is a very popular picnic spot for Indian tourists. Every May, a festival is celebrated in her name. 3 kms. from the Main Bazar in Old Manali, lies the Temple of Manu Maharishi. It is believed that this is the only temple of Manu Rishi in India, and it is here Manu meditated after he arrived in the area. Rohtang Pass an adventure tourist site located at an altitude of 13,050 feet above sea level on the Manali-Keylong road, 51-km from Manali town. It provides a wide panoramic view of mountains rising far above clouds, which is a sight truly breath-taking. The pass is open for just four months in the year from June to October when the snow melts. Close by is a small lake called Dassaur Lake. Beas Kund, the source of river Beas, is also nearby.. Built by Tibetan refugees in the late 1960's The Gompa is covered with brightly coloured frescoes and a mid size Buddhist statute. It also carries a list of the martyrs killed in occupation of Tibet of 1987 to 1989. The Gompa, is open from 6am to 7pm. There are three new and colourful Tibetan monasteries at Manali. This is a centre of a small carpet making industry. Two of these Monasteries are located in the main down-town of Manali and one Monastery in Aleo. 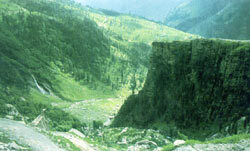 Aleo is located on the Left Bank of River Beas in Manali. Located 3 kms. from down-town on the Left Bank of River Beas. This institute also conducts other adventurous sports activities like high altitude trekking, minor mountaineering, rock-climbing, skiing, and high altitude rescue and relief courses. Tourists can visit an interesting showroom of Mountaineering Institute. It is a popular base for trekking and mountaineering in summer and skiing in winter.